In fall of 2012, one of the most awaited films of recent years debuted to audiences all over the world. 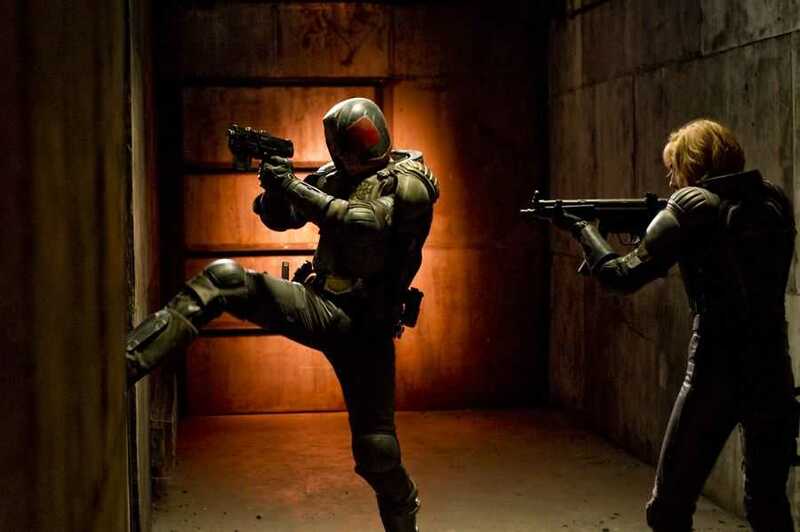 Following on seventeen years since the Sylvester Stallone-starrer Judge Dredd, which was a massive disappointment, audiences finally had a Judge Dredd movie which actually looked cool from all the promos and which seemed to correct the mistakes of the past. Sadly, nothing worked out as intended. Whereas the previous film had at least made back some of its money and more besides, the new one failed to recoup its investment in the first place, and the budget was even half of what it had been before. No doubt, several mistakes were made with the new movie, and they all contributed to what was eventually a box office flop. But since then, Dredd has gained a significant cult following. Whereas the theatrical release was a flop affair, the DVD/Blu-ray sales were highly encouraging. Stores, whether physical or digital, were constantly out of product. This was unexpected and on some level, this helped change perspectives. Now, there are talks of a sequel happening at some point, which is quite significant in and of itself. I can only hope that there is a sequel, because I enjoyed the movie. I pretty much loved it. Watch it with my highest recommendation. I am quite the recent inductee into the Judge Dredd universe, having started with a few choice audio dramas produced by Big Finish studios earlier this year in March/April. So I have a basic understanding of the character and of Mega City One but don’t know too much about it all. I did watch the old Stallone film last year but that’s a memory I’ve tried long and hard to burn out of my brain. That thing was just utter tripe, with bad acting, bad visuals, bad plot, bad everything. The only good things in it were the Judge Bikes, and Diane Lane as Judge Hershey. Traviss’ Dredd however is better than that travesty in every single way. The cast is stellar, the acting is superb, the visuals and 3D are amazingly beautiful and the themes and motifs of the movie are very clear and consistent. Whenever I see the topic of Judge Dredd come up, the words “satire”, “dark British humour”, “inflexibility”, “authoritarianism” and so on are thrown about. With nothing but the few audio dramas I’ve heard to go on, I can’t really judge the validity of these connections but I will say that at least the “satire” and “inflexibility” part are spot on. They inform the very essence of Dredd’s character and if you take those away, Dredd is no longer Dredd. The Stallone-starrer failed to impart that view on me, but not so with the Urban-starrer, which really is far superior. The film begins with a montage of “real-world” shots which depict the harsh post-apocalyptic life in the various Mega Cities, which aren’t really cities but supercities, spanning the geographical areas of several cities as we know of them today. The Judges, a law organisation that combines the role of police officer, judge, jury and executioner, is what maintains order in these various cities and they do it with a heavy hand. Knowing what I know of the setting, the montage is an excellent view into how things are in this particular future. I think I even identified a meat-wagon in one of the sequences, a corpse-collecting vehicle service employed by the cities. Go me! From there on the perspective shifts to Karl Urban’s Judge Dredd as the foremost Judge of Mega City One pursues a gang of drug-lords through the city streets and executes their boss in a really imaginative way (heat-seeker in the face!). The car/bike chase and the execution scenes are really well-done. They are low on the sci-fi elements barring Dredd’s Lawmaster bike and his Lawgiver assault weapon, and this serves as a quick intro into the setting since these are all iconic representations of the setting. I did have two niggles here though. One, the Lawmasters are too sleek and small, especially when compared to the ones from the 1995 film which I liked much better; these are too front heavy instead of being bulky all around with lots of hard edges. Two, the Lawgivers are also a bit small compared to what I’d thought they’d be. I don’t recall if the 1995 versions were bigger or not but that is the impression I had of them. However, good thing is that the selective rounds feature is just as kickass as ever. After this brief intro into how Dredd operates, including the chuckle-worthy line of “Negotiation’s over”, we move on to the bigger bits of the setting as the Chief Judge assigns rookie Judge Anderson, who pretty much failed the tests by a small margin but makes up with one of the highest psi-ratings ever recorded, to Dredd for an in-field evaluation of her contextual worthiness to be a Judge. That was a touch that I really liked. Anderson is a washout according to the tests and regulations of the Judges, but she is given a chance to prove how good she is in the field for a more accurate and relevant assessment. Certainly resonates with me, and it emphasises the “street-smart” approach over the “book-smart” approach. After their introductions are made, Dredd lets Anderson pick their first case together and she chooses to investigate the homicides in the slum-tower-block known as Peach Trees (there’s nothing peachy about this place!) and we are set for quite an epic confrontation. Karl Urban has excelled himself here in this film, proving that he is incredibly versatile and just plain awesome. He played Eomer in The Two Towers and The Return of the King, Leonard “Bones” McCoy on the Star Trek reboot, starred alongside an ensemble cast of veteran actors in RED, played the vampire antagonist in the post-apocalyptic Priest, and has had roles in The Bourne Supremacy and The Chronicles of Riddick. 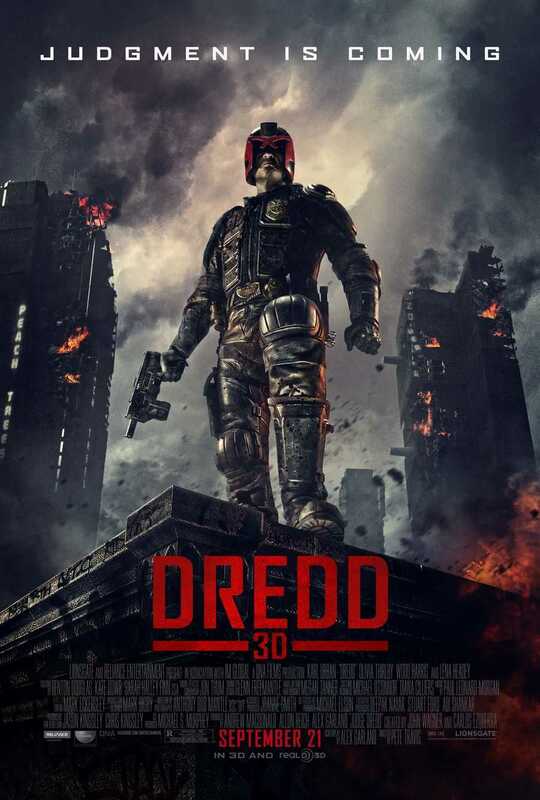 He has been impressive in every film I’ve seen of his (all of the above) and he continues that trend in Dredd. The challenge in the film is inherent: Urban has only his dialogue delivery, his chin, and his body language to wow the audience with since his character wears a helmet throughout the film which hides most of his facial features. Given that limitation, he still manages to prove that he can rise to the occasion because he convinced me that he is Judge Dredd, unlike Stallone who almost got there but also cheated by having his face exposed for significant portions of the film. That ain’t no fun! Urban gets his postures, his attitudes, and the general body language just right. His dialogue delivery is at times somewhat lacking however as the heavy, raspy voice doesn’t seem to come as naturally to him as it did to Stallone. The effect is all there though. Olivia Thirlby, cast as the rookie Judge Anderson, is the big surprise of the film. Having seen her in flamboyant and somewhat glamourous roles in films such as Juno, No Strings Attached and New York, I Love You I wasn’t sure if she would able to rise to the challenge of a character like Cassandra Anderson in such a harsh and gritty setting, but I was open to the possibility that she just might get things right. She isn’t a spectacular actress by any means, at least not until I saw her in Dredd, so there was ample room here for her to work with as far as I am concerned, and she goes on to meet my expectations in a thorough manner, even going beyond them in a few key sequences. To reference my experience with the audios again, I’ve only “met” the character in one of those audios so far, and she herself is a very cynically humorous type of character, and is also already a psi-Judge. Thirlby’s Anderson isn’t quite there as she is portrayed in a very early stage of her character. The movie can be considered to be her coming-of-age story in a way. My inexperience with the character was quite beneficial since it opened me up further to being impressed by Thirlby’s acting. And I was. Her portrayal is of an uncertain but dedicated rookie, one who is often also quite vulnerable given her telepathic abilities. An extended scene with one of the bad guys who seeks to shock her with thoughts of intense personal violence and horrific imagery is one such example where Thirlby rises to the occasion. Actually two since there is one part where we don’t see these “thoughts” and have only the characters’ acting to go on, and another where this is all played out in the bad guy’s mind. Compared to the rather inflexible and straightforward Dredd, Anderson in this iteration conveys a very harsh and gritty portrayal of Mega City One. Both the characters, thanks to the performance of their actors, show us a variety of the different aspects of life in the city and of the Judges themselves. Lena Headey, as the top baddie Ma-Ma aka Madeline Madrigal, is another top performance in the film, rounding out the excellent casting. She’s played Sarah Connor for the Terminator television series, Angelika in The Brothers Grimm, Queen Gorgo in 300, and is currently playing the role of Queen Cersei Lannister on the Game of Thrones television series which just finished its second season and has already been picked up for a fourth IIRC. I’m a Lena Headey fan and I’ve loved her in every role I’ve seen. Ma-Ma is as different a role for her as any she has done before and like her co-actors, she gives a stellar performance in Dredd. She is a cold-hearted villain who doesn’t give a damn what anyone thinks of her and just does what she does. Arrogant to a fault, Ma-Ma is a villain not to be trifled with, certainly not a cardboard-cutout baddie by any means. She is shown to be intelligent and ruthless, which is more than can be said for most female villains in today’s films, the big thing being that she doesn’t depend on her gender to do anything. I think that Headey was a good fit for the role because it showcases her talents and versatility like Urban and Thirlby. And that’s a running theme of the movie too. The best scene in the movie with her is when she takes control of a gatling gun in an attempt to kill both Dredd and Anderson. The entire plot, revolving around the brand new drug on the block Slo-Mo, is a pretty normal thing in contemporary cop movies, such as Bad Boys II for example. The basic plot could be that of any such movie, but what differentiates it is the setting and the characters. It has both feet firmly in the setting and in the real-world, which helped me connect with it on both levels. As the first film of a proposed trilogy, this works really well. The audience gets a good dose of the setting and they are set up for more flamboyance and bigger scope of things for a second film now that the characters and setting have both been established. You can consider it to be very much like Batman Begins or The Amazing Spider-Man in that regard. The movie is quite pacey, in keeping with the subject matter and content. There’s never any let-up in the action and the more personal moments are threaded well with them to keep the movie flowing. If you want a pure action film, you get that. If you want an action film that also focuses on its characters and develops them, you get that as well. But if you want a very character-driven movie, then Dredd isn’t for you I don’t think, since the main character is Dredd, someone who changes in miniscule amounts. The movie explores his character yes, but Dredd himself doesn’t grow, have an epiphany of the right or wrong of society or something. He is completely focused on his work and his duty. This is why Thirlby’s Anderson contrasts so well with him. The movie’s visuals are superb. Like I said, it is low on the flamboyance and the huge majority of the action focuses on a single location, the Peach Trees slum-tower-block. It’s very much like Phone Booth in that regard, although not quite so extreme. This approach could very well put-off some viewers but I think that this was the right thing to do. Having a narrow scope keeps the story itself focused on the events therein. It is all about giving the viewer the right introductory hooks to get them interested and nothing more, making it a perfect launch-pad for future works. Also, the best visuals in the film are the scenes involving the Slo-Mo drug, when the movie shows the effects of the drug from the user’s perspective. Everything slows down to a crawl, moving ever so slowly and it is all in stark relief. You can see all the details on the characters and locations. The 3D aspect of the film enhances this even further. So yeah, overall I loved the film, and would definitely see it on DVD even. A huge, huge improvement over the Stallone disaster and hopefully this will finally wipe the memory of that terribleness. Posted on February 26, 2014, in Movie Reviews, Review Central and tagged 2000AD, Action, Alex Garland, British Comics, Comics, Dredd, Drugs, Film Review, Judge Anderson, Judge Cassandra Anderson, Judge Dredd, Judge Joseph Dredd, Judges, Karl Urban, Lena Headey, Lionsgate, Ma-Ma, Madeline Madrigal, Mega City One, Movie Adaptation, Olivia Thirlby, Pete Traviss, Post-Apocalyptic, Reliance Entertainment, Science Fiction, Wood Harris. Bookmark the permalink. Leave a comment.